Why do cetacean crooners change their tunes? Whales, it turns out, are dedicated followers of fashion. There’s a style to the song they sing to attract mates, and that style shifts. To keep up with their very latest crazes, you need an underwater microphone and a discerning ear. In the world of fashion, no season arrives without some innovative designer presenting a new concept of what is attractive (think leg warmers, patent leather pants, purple shearling boots); by the end of the season, it may have become a short-lived trend that sweeps the population. But at the same time, some attire hangs around from season to season (think little black dress, crisp white shirt, and a great pair of jeans). Whale song appears to work in a similar way. Some styles come and go as quickly as hot pants and jelly shoes. Others, like trench coats and corduroys, catch on and become integrated into the collective wardrobe, and still others may endure and span eras, as timeless as a tuxedo. For whales, song is just a hierarchy of individual calls that they produce and repeat in a particular order for tens of minutes to hours. All whales generally sing the same song in any given season. But the song changes throughout the season and is never identical from year to year. We don’t know which whales introduce changes to the song, but we do know that the other singers adopt these changes and end up singing the same tune. Yet not every element in the song is always altered—in fact, some song features may be included consistently across years. Sound familiar? My research focuses on monitoring bowhead whale songs. Listening in on what’s currently in vogue is helping me and my fellow researchers to home in on the nearly secret lives these whales live among the ice floes in the wintertime Bering Sea. Because the Arctic and subarctic regions are seasonally ice-covered, it is impossible to keep track of whales visually throughout the year. 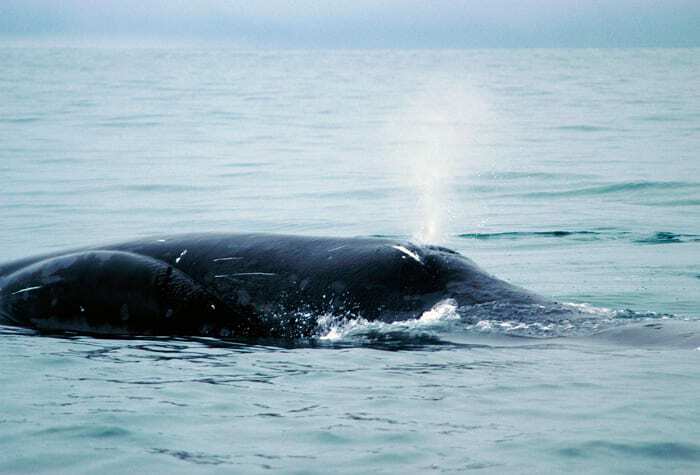 Eavesdropping on bowhead whale calls is a much more effective approach: It does not rely on good weather or adequate light and can continue for weeks to months. 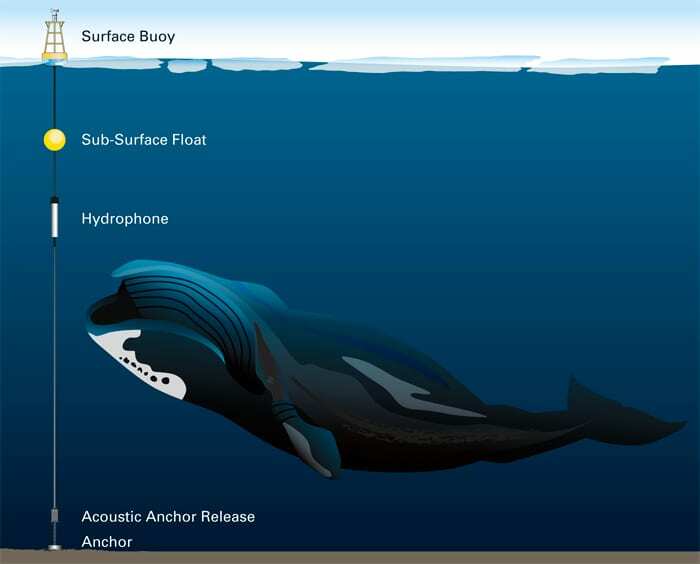 Essentially, we “tap the line” on singing whales by installing a recorder or a series of recorders at fixed locations in the ocean for months at a time. Most scientists agree that the Bering Sea is the likely breeding ground for many bowheads, but we don’t know exactly where the breeding grounds are. What we do know is that bowheads sing, and that the songs they sing are likely part of a display to attract a mate. Their song can lead us to our ultimate goal: learning where bowheads go to mate. We can’t count on a consistent whale song from season to season, and we can’t anticipate how the novel song features introduced by the “fashion forward” whales will emerge. To understand long-term patterns in song and keep track of whales over time by the songs they sing, we have to distinguish the long-running fashion classics from the passing fads. To discern these short- and long-term trends in the song, we record calls over months and years. Periodically we go back to our underwater recorders to retrieve the hard drive that stores the acoustic data. Then the real labor begins. Traditionally, some poor soul sits at a computer and goes through the acoustic data minute by minute, listening, looking at a computer display, and noting every call he or she hears. I have been that poor soul many times. To eavesdrop on the Bering Sea in the winter is to listen to the soundtrack of an ice-canopied jungle. When I first put on my headphones to listen to the soundscape beneath the ice, I was greeted by an underwater cacophony. 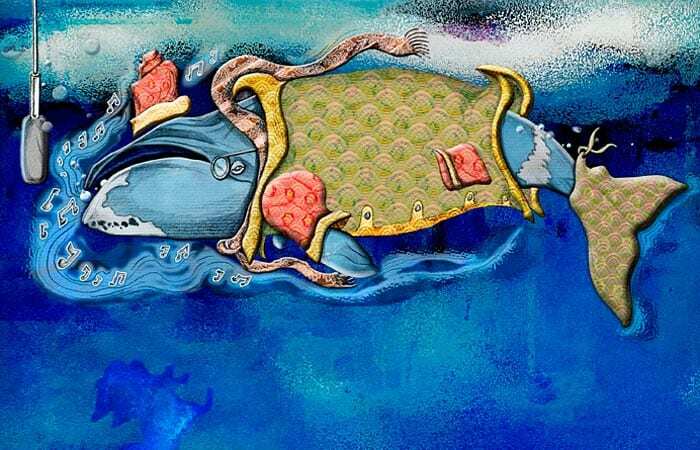 Singing bowheads were nearly drowned out by walrus knocks, the nearly extraterrestrial calls of bearded seals, and myriad other pops, whistles, cracks, and whoops. Picking out bowheads amid this din felt like trying to hear a conversation across the room at a cocktail party. But even before we could begin doing that, we had to process nearly 1,000 gigabits of acoustic data we gained access to through collaboration with scientists at the National Marine Mammal Laboratory in Seattle, Wash. 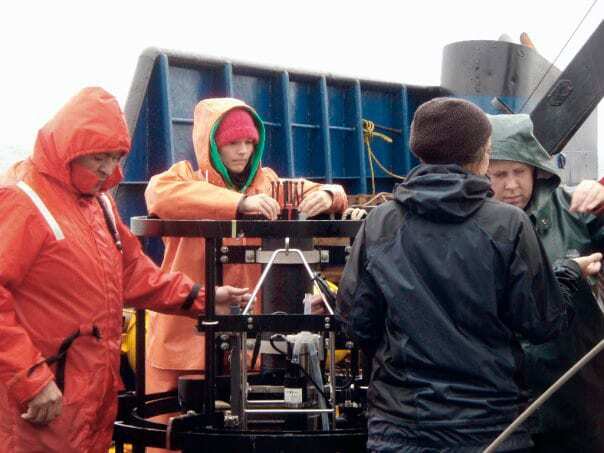 The data were collected over two years (2008 to 2010) at two locations in the Bering Sea. For one year of data, the analysis could take two or more years, if you are fastidious. You can see the problem with this approach immediately. To streamline wading through this unwieldy dataset, we are trying automation. Or semi-automation, because in the first step, I still manually review a portion of the acoustic data to identify each bowhead whale call I hear. So far I have created a library of roughly 80 individual calls. Now we will use this library of calls in combination with customized computer software that we recently developed. The program searches through an entire year of all accumulated acoustical data and finds any call that matches a call in the library. This record of “matches” will have to be double-checked, of course, because people are still much better than computers at pattern recognition. But the computer will be doing the lion’s share of the work, which is a significant improvement over traditional techniques. To track bowhead song across many years, we are also on a mission to identify the “must-haves” that might remain in bowheads’ acoustical wardrobe over the years. To do this, we will try to identify features of songs that are consistent across the acoustic record we are working with. Next, we will collaborate with researchers studying song in other parts of the species’ range to look for overlaps in our call library and theirs. The community of bowhead whale researchers then will potentially be able to track singers over time throughout the whale’s entire range, no matter what fashion risks are taken from year to year. Why bother with all of this bowhead detective work? Bowheads are a long-lived species—they can live more than 150 years—and they are the only large whale that is adapted to living in ice conditions. 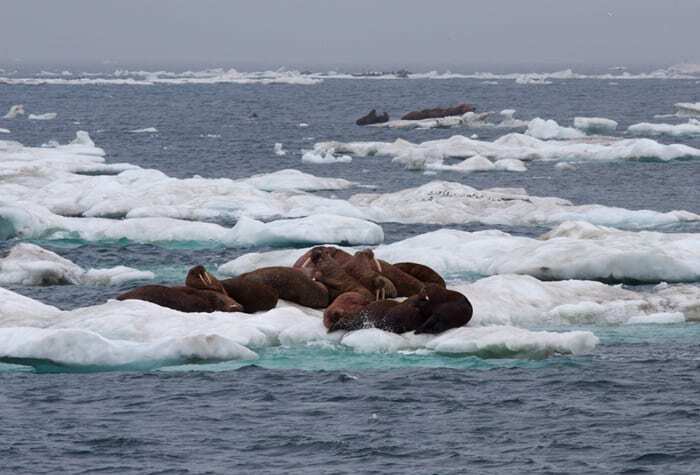 This distinction puts them on the frontlines of climate change; changes in the ways bowheads use particular habitats could tell us how variations in ice extent and other environmental changes in ice-covered oceans are affecting marine and polar ecosystems. In addition, natural resource managers want to know where bowheads breed so these areas can be protected to conserve bowheads in the future. So do subsistence hunters in the Bering Sea, who are perhaps more motivated than anyone to conserve bowhead whales. From their perspective, it is a bit like acting as a shepherd to your flock. Subsistence whalers harvest a small number of bowheads from the population each year with approval by the International Whaling Commission, and they are careful to target the appropriate individuals (no females with calves, for example). Subsistence whaling is permitted for these communities because there is sufficient evidence that the Bering Sea bowhead whale population is growing. Protecting breeding grounds will promote this growth, satisfying subsistence hunters and conservationists alike. Listening for bowhead song at multiple locations will help us figure out the relative importance of breeding sites to the singers. Knowing how bowhead whale song changes over time, how fast some features of their song change versus others, and how these features differ between locations will help us characterize singing behavior that may be specific for specific locations. Combining these clues will be critical for identifying strategic bowhead breeding grounds to protect. So remember that whether it’s you shopping for the latest handbag, or a bowhead whale shopping for a new song element, we all find ourselves on the same never-ending carousel of novelty and conformity. Do you think Coco Chanel knew she was also describing whale song when she concluded that “fashion is made to become unfashionable”? This research was funded by the North Pacific Research Board and the Arctic Research Initiative at WHOI.